British band Klaxons took the United States by storm when their debut album Myths of the Near Future was released earlier this year. Then a popular set at Coachella continued their ascent. The Klaxons, from London, have been hailed as the kings of “nu-rave” music, which combines elements of rock and traditional rave music – most notably the song “From Atlantis to Interzone,” featuring a rave siren. Klaxons have won numerous awards this year including NME Band of the Year, 2007 Mercury Music Prize, and XFM’s Live Breakthrough Act. The Owl Mag sat down with keyboardist and vocalist James Righton to discuss 2007’s whirlwind rise. The Owl Mag You recently passed through SF and played a gig at the prestigious Fillmore. How did it go? James Righton The gig went really, really well for us. It was an honor to play The Fillmore. It’s one of those historic venues that you hear so much about when touring. You always hear about The Fillmore and how it’s such a great venue, just like the Crystal Ballroom [in Portland]. It was a very memorable gig for us. We had a guy dressed up as a mushroom at one point. And we asked him to stay on stage and dance with us. He then comes walking towards us. But once he came on stage he got too shy. The last time we played at the Great American Music Hall and it was great but this was an honor. During the show, you mentioned the SF crowd was some of the best fans your band has. Why? J.R. The SF crowd is more like a European crowd. They are so sure of themselves, sort of standoff-ish, theY’re not just staring out. In Europe, it’s like a big party at shows as soon as you go on stage. I think people are used to bands going up there who are really tight and they feel like they need to entertain as well and it’s controlled chaos. A band’s image is about chaos and dynamics, which is what makes you. Is drummer Steffan Halperin officially a member of the group now? J.R. We were always a four-piece band. Steffan was always part of the group. The record was written by the three of us, it is our record, our baby. Steffan’s always been our live drummer and we’ll credit him on the next record. 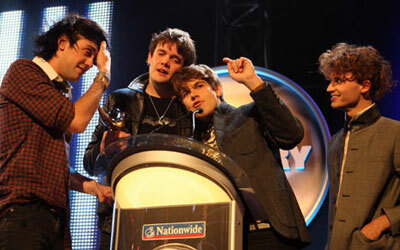 Klaxons recently won the Mercury Music Prize. That is a big honor. J.R. I think it was a shock at the time. I’m not sure we were quite confident that we would win. There were a lot of questions whether Amy Winehouse would show up or not. She did show up and performed. But yeah, the Mercury Music Prize was a great honor. It wasn’t necessarily about mass commercial at the end of what they were looking for. I definitely thought we had a chance of winning. But it was still a shock. We were pretty drunk when we got onstage and we were completely out of our minds. We just kind of rambled something. Is the band currently working on their second album? J.R. We’ll be touring the rest of this year and should have an album out by September of 2008. It’s going to be better than the first album. We’re getting a bit bored now playing the same songs every night! We’re always about getting in there and doing something new. You studied politics and history at Cardiff University. 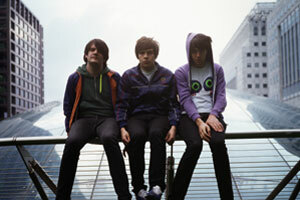 Do you see Klaxons as a political band in the future? J.R. No I don’t ever see politics as part of our music. I don’t think it always comes off that well when musicians mix with politics. Politics are such a complex matter that it is always quite embarrassing when musicians try to involve themselves and try to come off as if they know what they are talking about. It’s dangerous and the last thing you want to do is rant and rave about something you don’t understand. You’ll end up looking stupid.